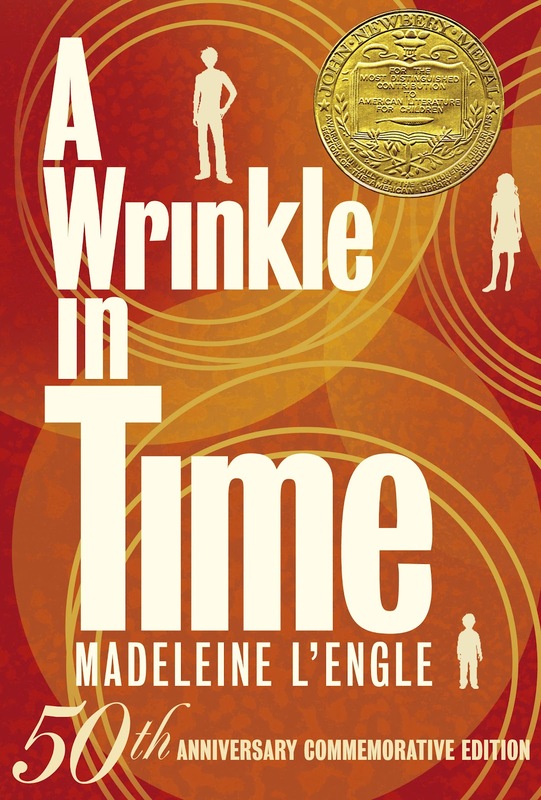 I know it's hard to believe but I don't think I've read A WRINKLE IN TIME by Madeleine L'Engle as a pre-teen. Looking back, I think I was a lot like Booking Daughter -- reading books all of the time but leaning towards the more fun or fluffy books. I'm sure I only read science fiction or fantasy when I absolutely had to, and I probably didn't appreciate that genre very much. I realize I'm a little late to the game, but I finally sat down a few days ago and read A WRINKLE IN TIME; and I'm absolutely kicking myself for not experiencing it as a kid. I absolutely adored this book! Yesterday was the 50th Anniversary of the book's publication, and it still is every bit as popular today as it was back then. So, what more can I say about A WRINKLE IN TIME than has already been said by people much smarter and more eloquent than I? In fact, I feel a bit intimidated by trying to "review" this classic novel. Rather I think I will just share just a few my thoughts about this outstanding story. Although I'm very sad that I didn't experience this novel when I was a tween, I am one hundred percent sure that I wouldn't have appreciated A WRINKLE IN TIME as much as I do as an adult. Maybe I wasn't a very intuitive reader back then, but I know I would have missed many of the subtleties (and in my opinion, best parts) of this story. There is no doubt that I enjoyed the suspense parts of this story when Meg, Charles Wallace and Calvin were trying to find Mr. Murray, but I most loved Meg and the overall messages in this novel. First of all, what girl wouldn't love the character of Meg? Even though I am old enough to be Meg's mother, I totally related to her; and I know I would have related to her even more as a tween/teen. Meg is just a remarkable character for so many reasons. Not only does she have those normal teen feelings of insecurity, but she is also short tempered and impatient. I adored how she turned her "weaknesses" into strengths rather than allowing herself to fail because of them; and I think she's a great hero and an extremely positive role model. And I hardly know where to begin when discussing the messages in A WRINKLE IN TIME. There are so many powerful and beautiful messages; and, while many are definitely universal, I think that some are special because of how they will resonate with individual readers. I was surprised by just how spiritual this book was, and I loved the life lessons that Meg learned throughout the course of this novel, especially as they pertained to good versus evil. All of the themes in this novel are valuable ones to readers of all ages and I don't think we can ever hear too many times about the power of love and hope. What amazes me (and probably what makes A WRINKLE IN TIME such an iconic story) is that the story and the messages are as timely today as they were 50 years ago when the story was first published. I appreciate the land of Camazotz and what it teaches us about the importance of independence and free thinking. And I think The Dark Thing, which represents all things evil, is one of the most powerful symbols that I've ever encountered in my reading. In a time when we are facing so much despair including wars, economic crises, and poverty, it's a wonderful reminder that it is possible to overcome darkness with love. But it was the feeling that I had when I finished the last page of A WRINKLE IN TIME that made this book so very special to me. I just felt all warm inside! I loved that this book shows that we can defeat The Dark Thing in our world by following our passions, and that with love, all things are possible. 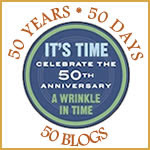 Thanks to Big Honcho Media for providing a review copy allowing me to be part of the 50 Years, 50 Days, 50 Blogs Celebration Tour. Make sure you check out the other stops on the tour tour or the A Wrinkle in Time Facebook page . I didn't read this as a child either. I read it for the first time a couple of years ago, and at risk for having tomatoes thrown at me, I just didn't get it. See, I think maybe I would have loved it more if I had read it when I was younger and had nostalgia for it. I didn't read this as a kid either, but I did read it to Vance when he was younger. He liked it more than I did, but he gravitates toward science fiction and fantasy. A Wrinkle in Time is one of my favorite books from my teen years. I really enjoyed it...I wonder how I'd feel about it now. While I did read it when I was a girl, I found that (like you) it meant far more to me when I reread it as an adult. This was one of my favorites as a child but I'm afraid to reread it for fear that the magic won't stll be there. Seems like I needn't worry based on your review!